A little over a month ago, this sweet little boy entered our family. 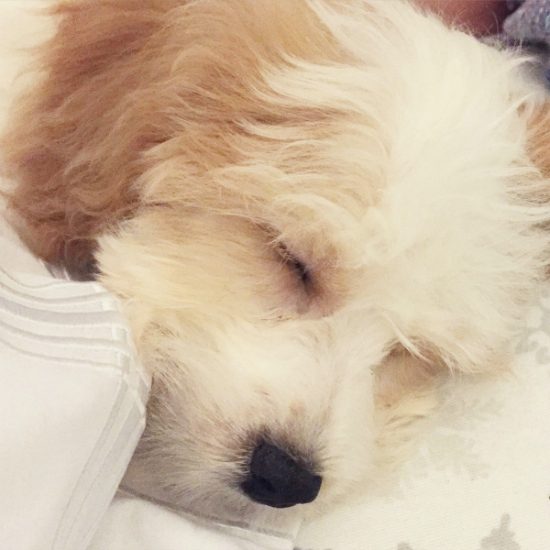 His name is Coby, and he is a cuddly ball of energy. With this new little addition, I realized there were going to be a few accidents along the way (you know what I mean). I decided to whip up a batch of carpet/upholstery freshener to use as needed. Essential Oil- I chose a blend called Purification®, but you can use anything you’d like… Not sure where to buy essential oils? Check out this post. 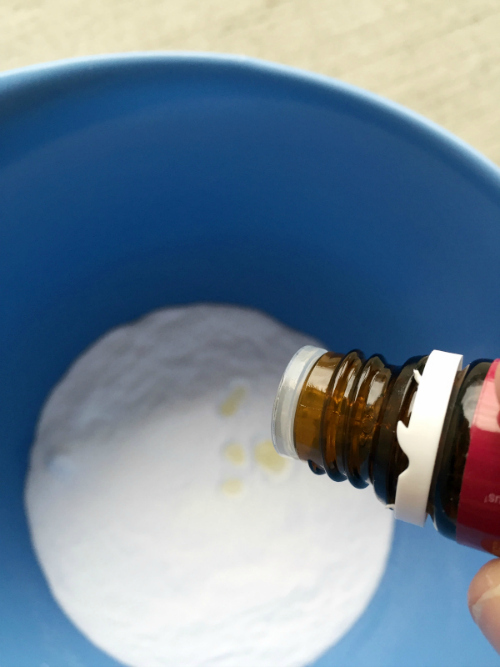 Baking Soda is excellent at absorbing odors, and the essential oil will leave behind a pleasant scent. 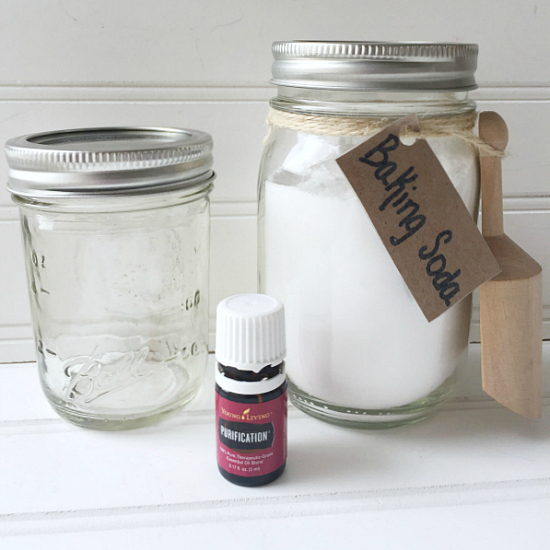 Mix 10-15 drops of essential oil per half-cup of baking soda, and store in an airtight jar. 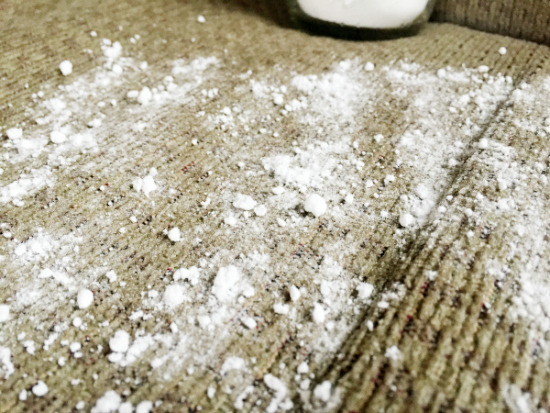 When you want to use the freshener, sprinkle a light coating on your carpet or upholstery, and wait 15-30 minutes. Once the time is up, use your brush attachment and simply vacuum up the baking soda mixture. If you are using this on a large area of carpet, using your regular vacuum cleaner is recommended. I have had the “pleasure” of using this mixture on a number of occasions. Once, puppy decided he had to go (number 2) on our bedroom carpet at 3:30 in the morning. I awoke to the smell, which tells you how unpleasant the odor was. After cleaning up the mess, I sprinkled this on the carpet, and waited the 15 minutes. I got out the vacuum, praying my kids would sleep through it (they did), and the smell was truly gone. This stuff is amazing! 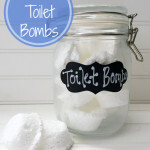 This post was originally published at Clean and Scentsible on April 8, 2016. I just ordered a bottle of Purification to get rid of stinky dog smell. Hi Erin. 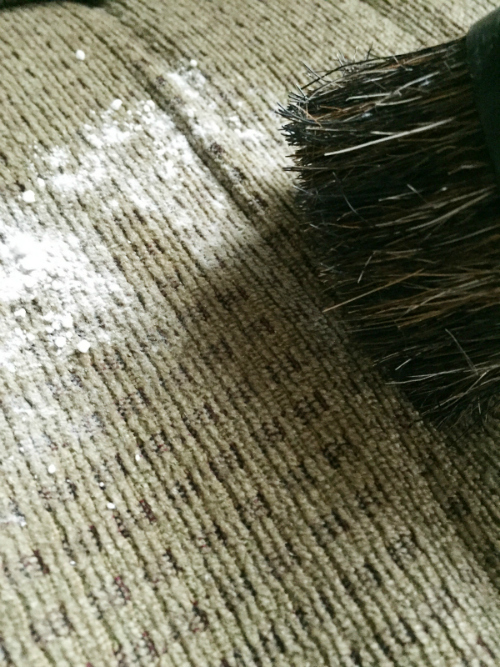 I love the idea of just using all natural baking soda to deodorize carpets. Who needs the chemical stuff anyway. I have to admit, my favorite part of the post is the photos of your dog! I rate Coby 10 out of 10 for cuteness!!! I love that there is a social push to be using eco-friendly products these days. 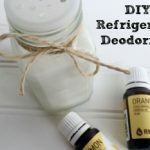 I love your carpet deodorizer recipe, thanks for the post. That sounds like an easy way to clean upholstery. 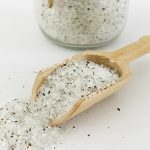 I never would have thought just two ingredients could make something that is supposed to be one of the best ways to clean something. I would love to try this out myself, my couch is starting to need to be replaced. I too never though a mixture of ordinary household products like rubbing alcohol and some water could remove stains from clothes and yet they do. I got more into the eco-friendly way of cleaning my house after one particular bad experience. I once tried to clean my rug with some commercial window cleaner. I must have mixed up the bottles or something as I had quite a lot of them in my closed. The chemicals in the cleaner didn’t remove the stain, but instead managed to make it bigger and more ugly looking. Needles to say, I tossed the rug and never bought a commercial cleaner again. What a great idea! LOVE your sweet puppy. I have two dogs and although they are “perfectly housebroken”, they hate going out if it’s raining! You might have heard that Texas is getting lots of rain this month…. I’m mixing a big batch of this recipe today!!! Love it! This stuff has worked SO well for us! Keeping my fingers crossed for some sunshine for you! Thank you for the great information on a natural carpet deodorizer. 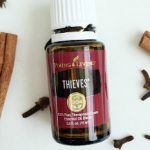 I love the idea of using essential oils versus all the chemicals in normal deodorizing products. I couldn’t agree more. 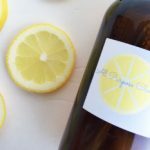 I have been switching out all my store bought cleaners and just making my own. I know it’s a whole lot safer for my family, and it typically costs less.